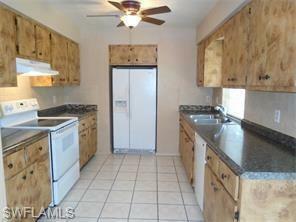 Lovely 3 bedroom, 2 bath home in the popular Fort Myers Villas area. It is affordably priced at only $1450 per month. 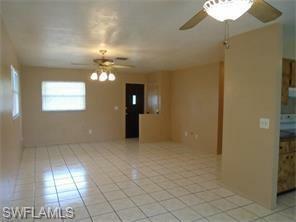 The home features an open floor plan with tile floors in the living areas and new carpet in the bedrooms. The bedrooms are all large and the closet space is great. The kitchen and baths have been updated. The sliding glass door leads to the screened lanai and gives you a view of the large back yard. There is an oversized utility room with lots of room for laundry, storage and even a work area. The sidewalk in front of the home is a wonderful feature. And the carport provides shelter from the sun and rain. The community is very friendly and as a resident of the community you will enjoy a neighborhood park that is part of this lovely community. There is also the Six Mile Linear Park that is just a short walk or bike ride away if you enjoy a little fresh air and exercise. This home will not last and it is available for April 1 occupancy. Listing courtesy of Lana Vail of Mayhugh Realty, Inc..